... So, Here is the place where we're going to show our ideas about skills, any great skills you have in mind, you had in your game, why don't you share it here? We can call this is "Skill's Sanctuary" #################################################### #################################################### Cool eh? Here is the first one! This is the must-have-skill in your game #1, Poison Bubble >Pop up from beneath an enemy, it explodes like a bomb and deal damage to only one enemy 25% * a.atk + 300 Poison damage >Then after exploded, it cast poison gas to all enemies +30% chance to Poison all enemies How about that? 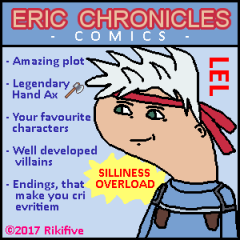 Eric Chronicles Comics - #001 "Comparing Axes"
Eric surely knows what is better. He is a veteran warrior after all. An awesome cover of Eric Chronicles Comics! How could you not buy it! Okay so time to put our brains to work. I well and truly believe the battle system used in Seiken Densetsu 3 was one of the best battle systems I have ever played with. It was fun, it was constant, you always had to keep an eye on the entire battle field and enemies could pop up at any time and the fact it kept you on your toes made me love it even more. In fact, I still from time to time play it whenever I'm well and truly bored and have nothing going on. Anyways I have this idea for a game I've wanted to make for a while now but decided before I ever did anything about it I would first of all get the battle system amongst other things sorted which brings me to what I want to talk about. Here's the idea. I got a typical scene of the Seiken Densetsu battle system here just so people know what I'm trying to get at. Now in this scene we can all see where the monsters are, the main character (who's HUD is at the bottom of the screen) and her party members. What I want to focus on is the little bars at the bottom pointed to by the white line. Combos Now in the normal battle system every time you attack a monster the bar lights up by 1 until it gets full and the next time you attack you do your special move. The battle system does have an ATB element to it because obviously everytime you attack you have to wait a few seconds until your character's ready to attack again so you need to be careful not to leave yourself wide open. I want to switch up how this works. Instead of having to attack to fill up the bars, I want the bars to act as your ATB bar itself. This way it makes it that every time you attack an enemy the bar drops by one and if you use up the entire bar then you have to wait until the bar fills up to maximum before you attack again. The upside is that you can technically crush your opponents with a combo but the downside is that you can be left wide open. Skills/Magic I still want skills and magic to be affect by only using MP but you have to wait a few seconds before you can use them. Although what I don't want is that stop in battle where you watch the move being used on your opponent or team members. I want that to be reserve for Special/Overdrive-style moves. HUD (red line) Now about the HUD, in the screen you can see it's spread across the screen but I don't want the HUD to be that big at all. I'd prefer if we could go old school with it and have only the player names, HP, MP, Level and Combo Bar in 1 row for each player if possible. I'd like to save the top of the screen for a hotbar of player skills, items and overdrive moves if possible. Player Switch Just like the actual game itself I want the player to be able to switch between party members with the touch of a button. Special Moves/Overdrive Now about this, I will explain this in more detail later because first and foremost I want the basics of the system created first before getting into more complicated things. Right so, feedback? Hi guys what's going on. Name's Tiny Fighter but you can just call me.....Tiny Fighter. Anyways this is actually my first time coming to this site and joining this forum. Anyone who recognises my username would probably know it from the older RPG VX forums. To be honest back then I was just a kid so I didn't really know what I was doing but now I've grown up a little bit and I'm no longer a kid.....I'm a Man Child . I've actually become a freelancer so I've come to this forum for a variety of reasons, one of which is that I become a better writer or coder. I've a lot of time on my hands (for the time being) so I intend to make full use of every single person on this forum. I look forward to getting to know everyone here. Peace out. Mister Zeno posted a topic in Archived Games -Projects that have been inactive for 12 months are stored here. ATTENTION! I've put a lot of work into this project and it's only a one man operation, so please check out this game and PLEASE leave feedback! Honestly, the feedback is what drives me to continue! A complete epic fantasy story crafted from beyond the time of Izschar, the mother planet of two moons; Trizia and Khil. Genre: Fantasy Average Demo Time: 4-5 Hours Game Progression: Introduction has been completed, as well as the beginning of the sub-plot. Expect to see Moonfall released early 2016 Recruitment: Closed Screenshots Story Greetings! The story of Moonfall is what makes it really special! Over the past 7 years, the story has been edited and tweaked to make it completely awesome! I've worked so hard to make the story incredible and it's just about reached that point! Hundreds of years have passed since the great war of Trizia and Khil. Over the decades following the war of the once allied moons, the crystals which once gave life to Trizia and Khil shattered, causing the moons to die. Shards from each moon fell to the surface of Izschar, disrupting the balance of life and causing once docile creatures to become hostile. These shards still contained small fragments of life from the two moons, which interrupted the climate and atmosphere of Izschar. Inhabitants of Izschar refer to this day as "The Fall," which eventually once again became the normal way of life. Until a group of scientists discover the potential of what little life was still contained in these shards, soon earning the title of "Flow," now the evil forces whom once dwelled in the shadows of Izschar, have come forth seeking this power. A story woven of deceit and plot twists, soon Eren is twisted and mixed into the amazing darkness that is The Fall. Characters Eren: A young man from the town of Azuel, desperate on becoming Izschar's best fighter. He knows little The Fall, but soon gets wrapped up with it's darkness. Kali: A skilled Black Mage from the town of Kaja, she desperately seeks the Black Flames searching for information on her father. Only two characters included in this demo, however, Moonfall has a wide variety of actors that can be switched out on the fly, as well as 3 different classes for each character! With over 12 story characters and 10 secret unlockable characters! Credits Thereisnoname Moghunter Victor Sant Khas Arcthunder Falcao Woratana Modern Algebra Yanfly Khas Nicke Galv Yami *Many many thanks to these guys, it would have been hard getting this far without you! * Features New Game + Several optional high level dungeons available after the main story 12 Main characters, 10 secret characters Party Switching to play with your favorite cast Complicated class/job combination system Over 35 unique classes and jobs Secret Classes/jobs Over 150 side quests already designed Awesome crafting and scavenging system Rare weapon smithing Over 1000 items already designed Current design supports 50+ hours gameplay (Not including New Game +) Designed for amazing replayability Moonfall supports a player housing system that evolves with the player, later on adding a party swapping crystal, class changing crystal a stash and much more! This first demo introduces the character and the world among with a small piece of the plot. It's mainly for feedback and testing. Nowhere near the final product, much of this is not final and will be changed. Feedback and comments are MUCH appreciated. Demo WARNING! This demo is LARGE, on average it's consumed 4-5 hours of gameplay. http://www.mediafire.com/download/3eg89w9d1tqkrdh/Moonfall_(Demo).exe * Updated Please don't forget the feedback! It goes a long way! Known Issues: Several bugs have been pointed out in the Peeking Pass, in the demo the Peaking Pass is really a rough copy, it's just there so the player can experience it, many changes are coming to it. Hello, So I've been composing music for a while now, sort of privately, and dabbling also in video game-style soundtracks and the like. I'm having trouble with getting those epic, pounding drums typical of most video game/film productions. If I may ask everyone, what VSTi are you guys using, what specific instruments, and what adjustments (effects and the like) are you making to get the sound you want from those drums? How to Make an Epic Game This tutorial is to help out THEAQIB here. When some hear "epic game", they tend to think huge maps. While it's true that a large map helps make the game feel epic, there's a bit more to it than that. Yes, that blue little square is my character. What makes a game epic is the importance and the exploration. It varies from person to person on what makes a game "epic" since people have different tastes and different opinions, but I will try to explain what I feel makes an epic game. Writing Game Design And that is my advice on making an epic game. You can find ways that are completely different than mine and still make an amazing epic game. These are just suggestions to help you get started and hopefully give you inspiration. I know what I am pretty much saying here is pretty difficult or nigh impossible to do, and if it has been done, I have found not hide nor hair of any evidence to support that. This idea is interesting to me but may already be doomed to fail. but hey can't hurt to discuss it, can it? I know about the final fantasy tactics like system and the shining force combat system as well, and I know there is one for RPG Maker VX Ace but I am not talking about that system, nor could I afford that at this moment. I am talking about building a legitimate army, from the ground up until the end of the game. even if it is just a story element and they only really come into play in cutscenes. would it be doable? Have the main story and build the army as a secondary/main plot device on the way to victory? I would say why having an army is relevant but It would probably spoil the possible story of the game I am going to make. Thoughts? Ideas of your own on this? any and all feedback and criticism is appreciated! Reaven posted a topic in Archived Games -Projects that have been inactive for 12 months are stored here. Hey all. So recently I started a new project, one that I've been meaning to do for a while, a Sonic RPG. I've been a fan of Sonic for a long time, since his 1989 video game release on the genesis, and have remained his fan since then. However, ever since Sonic and Knuckles, I haven't played very many of his games, thankfully. His transition into the modern game era hasn't been kind and I've found that his character is sadly lacking in development. Only the comic's have thus far remained true to the character and done a good job building him and its a shame that not many people know all of what he's gone through. That being said, I decided that I was going to create an RPG that would be more appealing to older audiences, a darker, more grim setting with believable character progression. Basically, Sonic has been gone on a lengthy adventure with Tails in another dimension, and returns to find that the world has been taken over by Dr. Robotnik and he is forced to go underground, starting a resistance against him, rescuing friends and fighting back. A couple of ideas have already been implemented, The ability to play the main story as characters other than sonic, Branching and extensive romance sub plots, for the fan to explore other relationships besides the default ones, a crafting system to add to the believability of being underground, a mission based plot development and side missions, including personal missions for various characters, and I've partially implemented a new sound track, for a more darker, sci fi feel. I want this game to be kind of game that can be loved by both old Sonic fans and newer ones and will Do my best to make it as such. However, I am limited in ability and am just one man. I would greatly appreciate any help on this project and would love to hear what others think of it. Edit: I have a couple of screen shots to share, one of the current title screen and another of a battle, showcasing one of several added enemies. Sughayyer posted a topic in Archived Games -Projects that have been inactive for 12 months are stored here.